Vaikunteswari siri ki nagari Adhigo mahima giri..
.. .. .. song from Allu Arjun starrer ‘Badrinath’ sung by Shankar Mahadevan, MM Keeravani – music by Maragathamani Keeravani. In recent times, I have heard this song at least 100 times ~ so impressed by the Song, music, picturisation and most importantly .. .. ‘Jai Bolo Badrinath’ – the holy place for Sri Vaishnavaites. Badri & Kedar are associated .. .. .. .. Kēdārnāth Mandir is dedicated to Lord Shiva. It is on the Garhwal Himalayan range near the Mandakini river in Kedarnath, Uttarakhand in India. Due to extreme weather conditions, the temple is open only between the end of April (Akshaya Tritriya) to November (Kartik Purnima - the autumn full moon). 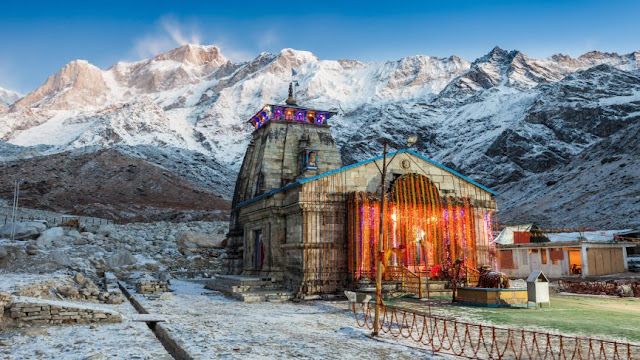 During the winters, the vigrahas (deities) from Kedarnath temple are brought to Ukhimath and worshipped there for six months. Lord Shiva is worshipped as Kedarnath, the 'Lord of Kedar Khand', the historical name of the region. Our Prime Minister worshipped here when the Temple was opened after the floods and visits almost every year on special occasions – this year he visited on Deepavali day and celebrated the festival with our army jawans in the region. The temple is not directly accessible by road and has to be reached by a 18 kilometres (11 mi) uphill trek from Gaurikund. Pony and manchan service is available to reach the structure. The temple was initially built by Pandavas, and is one of the twelve Jyotirlingas, the holiest Hindu shrines of Shiva It is one of the 275 Paadal Petra Sthalams, expounded in Tevaram. Pandavas were supposed to have pleased Shiva by doing penance in Kedarnath . The temple is one of the four major sites in India's Chota Char Dham pilgrimage of Northern Himalayas. In 2013, massive flash floods swept through Uttarakhand. The deluge claimed 197 lives. 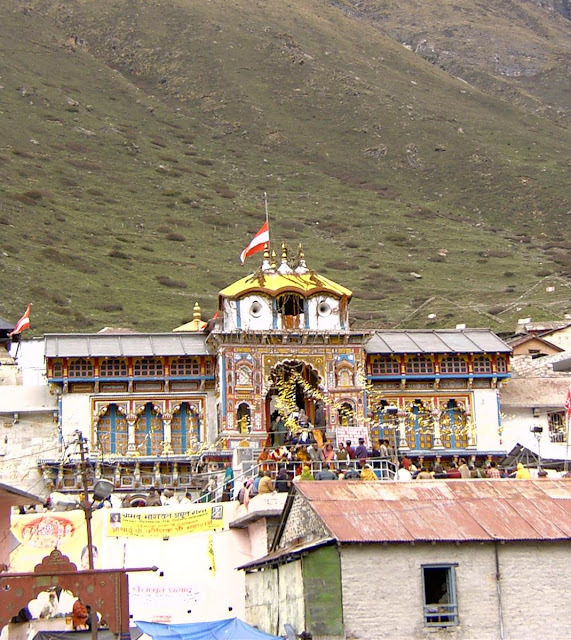 Kedarnath was the worst affected area during the 2013 flash floods in North India. The temple complex, surrounding areas and Kedarnath town suffered extensive damage, but the temple structure did not suffer any "major" damage, apart from a few cracks on one side of the four walls which was caused by the flowing debris from the higher mountains. When I heard the name of the movie as ‘Kedarnath’ – I feared that it could be yet another stupid, so called ‘love-story’. One review states that it takes 10 quick minutes to figure out the story of Abhishek Kapoor’s Kedarnath. Even if you haven’t seen the trailer. Even if you don’t know anything about the film. Starring Sushant Singh Rajput and debutant Sara Ali Khan, Kedarnath begins by paying tribute to the victims of the “Uttarakhand floods in June 2013”. The film opens in May 2013. The hero, Mansoor (Rajput), is poor, a porter; he’s also a Muslim. The heroine, Mukku (Khan), is wealthy and a Hindu; her father is a pandit. Her fiancé, Kullu (Nitesh Dahiya), is a greedy businessman who wants to suffocate the town with tourists (and lodges). He’s also condescending towards Mansoor. Kullu likes Mukku; Mukku likes Mansoor. Take any masala movies – who bothers ! – let the hero at the top of voice speak about building hospitals in place to temples (otherwise silent); exhibit his ignorance of economy, taxes, welfare economy – just shout of populism, sprinkle with care for couple of old and animal, speak against Hindu traditions and festivals – movie is complete. Kedarnath movie’s mediocrity is unique: it doesn’t entertain; has no logic, only offends. It just exists without joy or reason. Love may well be a pilgrimage, but Kedarnath takes you on an arduous trek to a shrine which Hindus believe most .. and you can ridicule it so easily. Before posting comes the news that the Uttarakhand government on Friday banned the screening of ‘Kedarnath’ across the state, citing probable disruption of law and order if the film was screened. Predictably, now you will hear sounds against Trivendra Singh Rawat the eighth and current Chief Minister of Uttarakhand as being a Hindu fanatic. Following objections from several g groups, including leaders of his own party, Chief Minister Trivendra Rawat had formed a committee, headed by tourism minister Satpal Maharaj, to decide whether or not the film could be screened in theatres across the state. Maharaj said, “We watched the film yesterday (on Thursday) and by 8:30 pm, we had decided that although there should not be any ban on any work of art, the law and order situation also must be taken into consideration.” Based on the committee’s feedback, CM Rawat ordered all 13 district magistrates to review the law and order situation in the respective districts and then take a call accordingly. Maharaj added - “My personal objection is also over the name Kedarnath. People visit the shrine to attain moksha (liberation), so the film should not have been named after a place of such purity. Aap ‘Qayamat aur Pyar’ iska naam rakhte toh aur acha hota (It would have been better if the film was named ‘Qayamat aur Pyar’),” he added. Moving away, in 2011, there was a Telegu film by name ‘Badrinath’ directed by V. V. Vinayak, produced by Allu Aravind. The first para was about the song ‘Omkareswari’ from that film starring Allu Arjun in leading role along with Tamannaah and Prakash Raj. The film revolves around Badri, a skilled warrior trained by a religious Guru Bheeshma Narayan. After being made the protector of Badrinath temple, he finds his loyalties divided when he tries to revive the faith of Alakananda, an atheist, in God and gets caught in violent battles with her cruel uncle Sarkar, while his Guru suspects him to be in love with Alakananda, something against the rules for becoming his successor. In the movie, Bheeshma Narayan is a religious guru who prepares an army for the protection of all the ancient Hindu temples from terrorists. Of all the valiant and talented warriors in this elite army, Badrinath (Allu Arjun) is one who is groomed by Bheeshma Narayan and wishes to make Badri his successor. Badri fights to save the temple and its devotees .. .. ..
Telegu tinseldom is devout and often portrays Hinduism in good spirit – NT Ramarao was a classic example, and he was not the pioneer.